You’re not thinking that? Oh. Would you like to? And you would be right to dash my illusions. 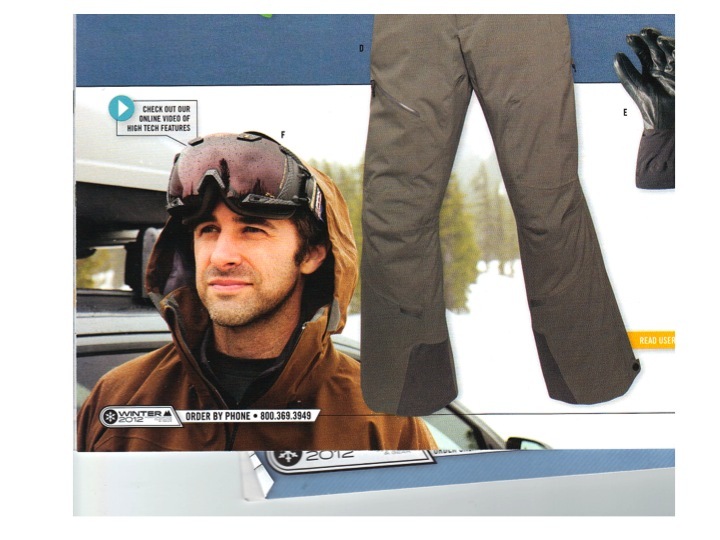 Last Spring I did a shoot for athletic gear, which I talked about in the post Skiing With The Attractivesons, and said I would include some of the photos when the catalogue came out. This has turned out to be a lot more difficult than it should have been. Now, it’s pretty standard practice to tell the actors or models that they’ll send you copies of the photos with you in them, and then roll their eyes when you’re not looking. It’s also pretty standard to not send you copies of whatever the finished product is. The family who looks nothing alike? The toboggan rides with Santa hats? Did I… did I dream that? I kept my eye out for the catalogue, and kept not seeing it. And not seeing it. And not seeing it. Finally, it was December and I thought that if the catalogue wasn’t out yet, they’re marketing department needed a little shake-up. A little pot stir. 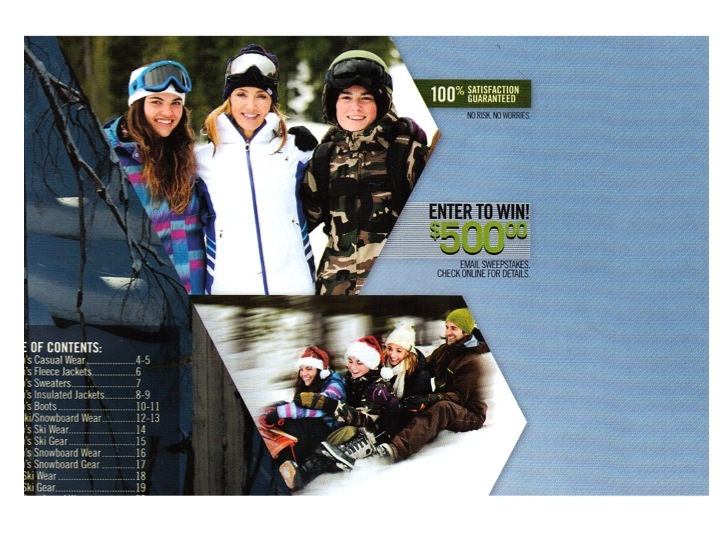 I called the company’s information line and asked for a copy of their Winter catalogue. This was seeming like I’d been the victim of an epically weird prank. Or the most thoroughly thought-out stalking. Ever. Like the ski goggles? $600. Comes with GPS. Also, four $100 bills, I’d assume. So nothing came of it. I hung up. I tried the company directly and couldn’t reach the guy in charge. Finally, a couple weeks ago, I was having dinner with friends, and someone there worked for the company. I asked him about it. He actually had a couple copies of the catalogue. I told him about my experience. They shot the materials for the catalogue. But didn’t tell anyone about the catalogue. Ah, there’s nothing like a hot cup of empty, and some fleece outdoor-wear in front of a roaring fire on a May afternoon, is there? Boy, I just don’t understand how business works; because that seems, well, silly to me. 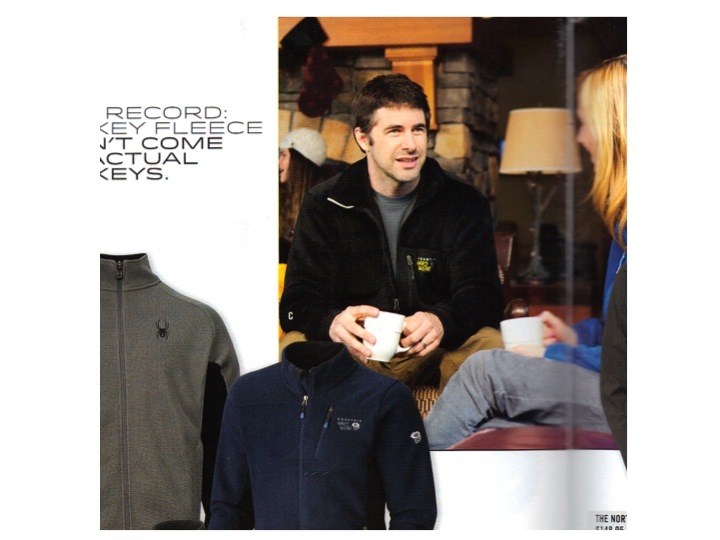 Flipping through the catalogue, there were a couple good shots. Several key elements they left out – the plan had been to make the theme “High Performance” but they didn’t include any of the shots of me careening through the ski park’s parking lot in this very cool, very fast, car; my pretend family grimacing and clutching the seats in terror. Lame. So, not only is it not people running up to you on the street to tell you how wonderful you are, and being flown to exotic locales, it’s spending a month on the equivalent of a geocache hunt to find a catalogue that the company is trying to keep anyone from seeing. P.S. – Don’t forget to submit your entry for the caption contest! But my head’s as itchy as if I was wearing a santa hat in May. (I’m trying to say that this is a real head-scratcher.) And no car? Psh. The pictures are great, though. Totes pillowcase worthy. And I’m not ashamed of that wizard photo! I’m proud! Proud! Nah, that’s a lie. Seeing it was like a magical portal taking me back to jr. high while wearing out of fashion clothes. I should’ve figured you were a model. You have that Smizing (eye smiling?) thing that Tyra always hollers about. So the snow is artificial? Snotoshopped? No, there was still snow up at the mountain. Wet, sloppy, disgusting end-of-year snow. I really don’t understand the whole catalogue hoarding thought process. The pictures are great and your fake family are really a good-looking brood. The photo with the little arrow pointing to the goggles gave me a chuckle. It reminded me of those photos you see in motorcycle magazines where the half naked girl is spread eagle on a bike and then there is the little arrow to snap you back to reality..”you’re here to shop for a bike.” You’re officially …. a lure or snow bait. And I’m definitely putting “snow bait” on my resume now. It’s a compliment! Oh, “Snow Bait” needs to go on the resume. If that doesn’t land an interview, we clearly live in a world of drones. Maybe that’s how I should spin it. Like it’s so elite. Believe it or not this has been a common practice for a lot of companies for several years now. Some have completely stopped producing catalogues and only promote online. Others keep them mysterious and you can only get them if you can figure out how to order them. They usually only have a small portion of the stuff in them and always direct you to find more online. It all comes down to cost. By the way, all the snow around here right now is fake too. That’s interesting – the whole “You have to be cool enough thing to be a member, and the way you’re cool enough is if you’re a member” approach. It works, sad to say. Every time I spend too much at REI I’m reminded of that. Yeah yeah yeah, obscure and never seen catalog, blah blah. But . . . can you introduce me to George Clooney? I mean, that’s what I got out of this post. That was the entire point, no? Hm, I’ll see what I can do. Clooney might be tough, but last night I had a dream – for some reason – I was friends with Stephen Colbert, and that might be an in with him! I’m sure that catalog is being researched. The company has top men working on it right now. Top. Men. Nicely done. Very, very nicely done. I don’t get it. A catalogue for no one to look at? What good is it? How do they sell anything? Well, at least you got paid, right? You did get paid? They told me the check is hidden under a rock somewhere within city limits. I’m closing in on it! See, you should thank them for removing those pictures. I think it’s just better for the safety of our melt prone faces. Face Melter. That’s another one for the resume. Drag you get all the ski shoots. One of my coworker’s daughters always gets swimsuit shoots and gets all the tropical shoots BUT they only pay for like a day or 2 (she usually stays extra!). Well, I live in the mountains, so skiing/hiking/etc. tends to work out better. She lives in Missouri. We were 12F today 🙂 She flies to whatever gig. Just rename the blog to The Attractive Man and own your unpublished but printed status. It’s actually painful for me to write about this stuff, because it always feels like I’m saying, “Oooooh, look at me, everybody! I’m so handsome that people pay to take pictures of me being handsome in their stuff!” As though I’m either flaunting it, as if it were meaningful, or – worse – being falsely modest. I finally decided, okay, it’s stuff that happened, it’s a blog… I’ll go with it. The modesty is noble, but misguided. You have the right “look” for the client, simple as that. Some might prefer Rowan Atkinson, you know. Yes, but it’s really hard to say that without sounding defensive. Ironically, I got an SEO for “ski jacket” yesterday. I searched Google images to see what photo of mine could have brought someone to my blog. I only checked the first two pages and didn’t find anything. Hey, maybe your photos are posted there! I love trying to figure out why Google sent people my way on Image searches. I’m not complaining, I just can’t figure it out. Last week, in the space of one hour, I got 175 hits from people looking for “The Monopoly Guy.” I really, really wish I knew the story there. That is a LOT of hits! Whoa! Yeah, I think maybe you need a new agent? You are making me, like, soooo glad I turned down that offer to be a supermodel. But I’ll look for you on the next box of cat food I buy. Maybe they’ll put your face on a tabby. Oh, I could do “cat.” Just give me a chance. Ah, the science of marketing… Well, at least you look good in the photos. And you’re right, it just doesn’t have that “high performance” feel to it. Did you have to ski during the photo shoot? No, we got up to the lift, then turned around. I brought my gear, just in case. Team B got to go into the woods with snowmobiles, skis and tow-ropes, so someone could get hauled along. Now that you have your long awaited print work will you be adding it to your portfolio? Or, as the industry calls it your “book”? My blog is my portfolio. For some reason that’s not working, though. You are FIERCE in those goggles! That’s the steely-eyed look of trying not to wince while tiny, tiny particles of sleet whip in my face. Next I’ll be discussing my ability to fly. Well this just bursts my bubble. Next thing you’re going to tell me is that the women in the Victoria’s Secret catalogue aren’t really all frolicking in their skivvies by a fireplace in a gorgeous log cabin. Oh, that’s all real. And any commercial where an “actual customer” tells you how great the product is, is just some random customer, not an actor who was given the product to make him, technically, a customer. Lots of money spent. No results. Trying to keep it a secret. Hmmm…was this financed with bailout money and coordinated by the government? Sure sounds like it. “Gary’s Secret.” Much less appealing. Seriously? …SERIOUSLY? Too much attractiveness and talent. Can not compute. Look, I’ll come clean. The reason they have no more catalogs is because I stole them all. I had to hang your pictures in my locker. I have a rather large locker. I would like to think that at least one of them has a big heart with “25TF + TBM 4eva” written in it. I can confirm this as factual, only the inside of the heart actually reads, “25TF + TBM = MFEO”. That’s, “made for each other” if you haven’t seen Sleepless in Seattle. Well, at least you figured out an actual photographer was taking the pictures, and not some Golem character hoarding them all in his basement going “My precioussssss” while rubbing the pictures over his face. I actually do some pinafore modeling on the side, myself. And thanks for reminding me that the Spring pinafores come out soon! I am nothing if not tasteful. That would be a strangely impressive effort. That creature freaked my son out when he was a toddler before he he learned to speak – he desperately signed “Finish! Finish” and cried … I think he’s scarred for life 🙂 he has no desire (now aged 10) to see scary stuff. Yes, Charlemagne. That has been bugging me. Thanks for helping me put my finger on it! The hats had to have been photoshopped, or the downhill speeding action was. Those Santa hats should have been blowing in the breeze! And no, that’s real hats, really sledding. They’re cinched on really tight, and that’s only seconds in to the sled ride. THank you for reminding me of the Byronic/Galdalf experience. It makes my soul happy. I oversee a catalog design twice a year – seems crazy to go to all that effort to make something that you keep secret – wow. I’m sure it’s something that sounded reasonable in the boardroom. And the five people thinking “that doesn’t make any sense” didn’t want to get yelled at. Some stores sell (or used to sell) print catalogues. I have a vague memory of shopping for curtains at Sears (or some store like it) in the early 2000s and wanting a catalog to take home, and discovering they weren’t free (I think they were $5.00). Really? You had to pay for a catalogue? Wow. Corporate America (and England) found out we had a baby and we get catalogues for baby clothes daily now. That makes sense though, because on your own you’d go to somewhere cheap. But it’s physically impossible to look at pictures of cute baby clothes and not buy them. Tag your it! Time for your award! I love that there is an empty pair of pants about to walk right over you. Product placement? I’m sorry. You lost me with that wizard photo link. What was this post about again?